Windows 8 Metro Look can easily be achieved on Windows 7 using a set of desktop Widget without actually changing the theme, RAM and CPU consumption is less. This is what this Windows 8 Metro Widget, running on XWidget can do. You can read an article on XWidget itself. It says about XWidget in details. Windows 8 Metro Widget for Windows PC is developed by physx4. Previously we posted a post on XWidget system. You need to install xWidget from that previous post for this one. As we have mentioned, you need to install XWidget first from the previous post before using Windows 8 Metro for Windows PC. Download this widget set; double click to install. Right click to check various features of the Widget set. It is an ZIP package, 1.8 MB in size. This Article Has Been Shared 5659 Times! Customize Windows 7 and XP with only few clicks with Skin Pack Installer System. This app helps to customize shell32, explorer.exe, License, Setup and more. Aero Search Bar Widget for XWidget for Windows 7 is an innovative Aero widget running on XWidget engine. Funny Metallic Recycle Bin Widget named as is Woofie Trash is nice looking desktop widget and is suitable widget to customize windows to a newer look. Lumia Clock Widget is a realistic translucent clock gadget with additional calender display. Apart from customizing your Windows PC it is an useful app too. This Widget runs on XWidget Engine. 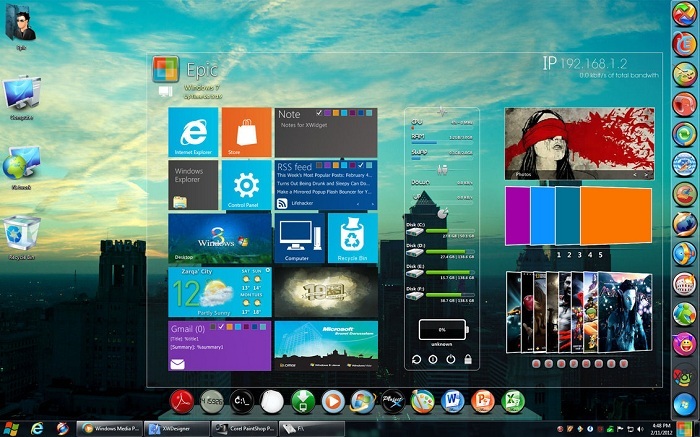 Cite this article as: Abhishek Ghosh, "Windows 8 Metro Look For Windows 7," in The Customize Windows, March 3, 2012, April 21, 2019, https://thecustomizewindows.com/2012/03/windows-8-metro-look-for-windows-7/.